Writers Tsering Woeser and Wang Lixiong speak for many voiceless Tibetans. For Tibetans, the year 2014 meant arrests of anyone openly voicing dissent against China’s rule, the further displacement of Tibetan nomads, and intensified police controls over monasteries. It was also a year in which the number of self-immolations inside Tibet rose to 136, as monks, intellectuals, and ordinary Tibetans alike sacrificed their lives in calls for freedom and the return of their exiled spiritual leader, the Dalai Lama. No one writes more authoritatively on these subjects than Tsering Woeser, a Beijing-based Tibetan author whose writings are banned inside China but who still speaks out, publishing essays and poems on a blog hosted abroad. In "Voices from Tibet" – 41 short essays packed into a single slender volume – Woeser and her husband Wang Lixiong, also a well-known writer, speak eloquently of the plight of Tibetans who face restrictions on their freedom of speech, the destruction of their environment, and controls over their culture and religion. The authors speak from a vast range of historical knowledge and extensive experience on the ground.For anyone who knows something about Tibet but wants to go deeper into the subject, this book might offer the perfect next step. The essays cover everything from the history, economics, and religion of Tibet to Han migration into the region and the Tibetans’ resistance to Chinese rule. Many of these articles first appeared as pieces prepared for broadcast to Tibet by Radio Free Asia (RFA), for which Woeser and Wang are regular contributors and where I work as the chief editor. The essays have been ably edited and translated by Violet Law, an American journalist based in Hong Kong. In a major addition to the book, Robert Barnett, a Tibet specialist at Columbia University, has written a comprehensive 29-page introduction to the book that deftly describes how Woeser and Wang developed their thinking and insights on Tibet over the years. I’ve met Wang, a well-known writer in his own right who has been allowed to travel abroad from time to time, but I’ve never met Woeser. The Chinese authorities have denied her a passport and any chance to leave the country. Woeser, Tibet’s best-known female writer, now works in the shadow of constant police surveillance. The State Security police even camp outside her Beijing apartment from time to time. She has also undergone numerous police interrogation sessions. In 2008, following a major Tibetan uprising against Chinese rule, she and her husband were held under house arrest for several months. Wang and Woeser devote five of their essays to the subject of “Wrecking Nature,” including one by Woeser on the plight of nomads who leave their grasslands only to discover that they were spending more in the cities than they could earn. Wang describes Beijing’s policies toward Tibet and tries to explain to his fellow Chinese how they might relate to China’s non-Han minorities with more respect for their cultural and national identities. Wang also explains how in the name of “aiding Tibet,” a Chinese provincial government poured large sums of money into a public square – built entirely in the Chinese style – located in Chushur near the Tibetan capital of Lhasa. Wang describes the square, plastered with with political slogans and the likenesses of Chinese Communist Party leaders, as a display of state power and the epitome of “cultural imperialism." In another essay, Wang describes how Han Chinese tour guides now provide tens of thousands of Chinese tourists with a false version of Tibetan history. Woeser’s writings enable her readers to understand the feelings of Tibetans, their deeply held religious beliefs, and the everyday pressures that they face. 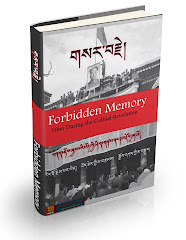 One of her best essays deals with the framing and imprisonment of a well-respected Buddhist lama, Tenzin Delek Rinpoche, who was accused by the Chinese authorities of being a terrorist. Another discusses a six-year-old Tibetan boy who disappeared after the Dalai Lama, in accordance with Tibetan tradition, confirmed him to be the Eleventh Panchen Lama, the second highest-ranking monk in Tibetan Buddhism. The Chinese, meanwhile, went on to select their own state-sanctioned Panchen Lama. 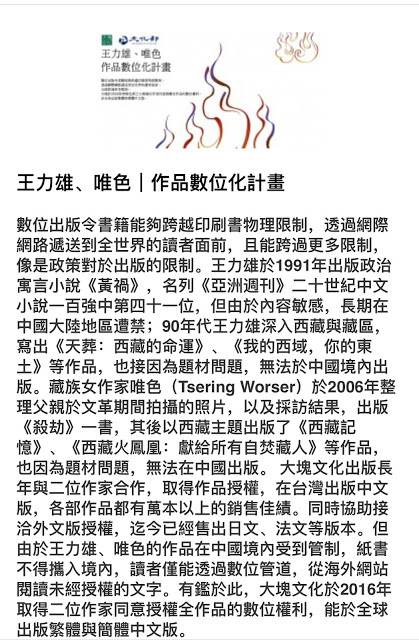 Looking to the future, Woeser asks if Tibetans should place any hope in “the Chinese Dream,” which is the oft-repeated slogan of China’s current president, Xi Jinping. Woeser nevertheless finds grounds for hope in the young Tibetans who still want to study the Tibetan language despite Chinese efforts to promote the Chinese language at all levels of the regional educational system. “Thanks to Beijing’s efforts to snuff out our cultural practices, ever more Tibetans, especially the younger generation, are taking them to heart,” she writes. Knowledgeable writers have published other books on Tibet over the past year or so, and expert colleagues of mine tell me they’re also worth reading. Warren Smith, a researcher and writer for RFA, who has spent decades studying Tibet, recommends in particular Gabriel Lafitte’s book "Spoiling Tibet," published in September, 2013, which focuses on China’s exploitation of Tibet’s mineral resources. Another recently published book worth mentioning is "Meltdown in Tibet" by Michael Buckley, a Canadian journalist, who describes, among other things, how Tibetan nomads are forcibly relocated to make way for mines and dams. But I’m guessing that for those who are not yet deep into the study of Tibet, Woeser and Wang’s book offers the best chance next to actually going there of experiencing a visit to the roof of the world. But don’t look for their book in a bookstore in China. A few copies briefly appeared in a bookstore in Beijing’s Sanlitun district, but the police moved in and quickly removed every copy from the shelves. If "Voices from Tibet" merits that kind of attention, count that as another reason for reading the book. Dan Southerland, a former Monitor correspondent, reported from Tibet in 1987 and 1988 and covered Tibet issues as bureau chief for The Washington Post from 1985 until 1990.